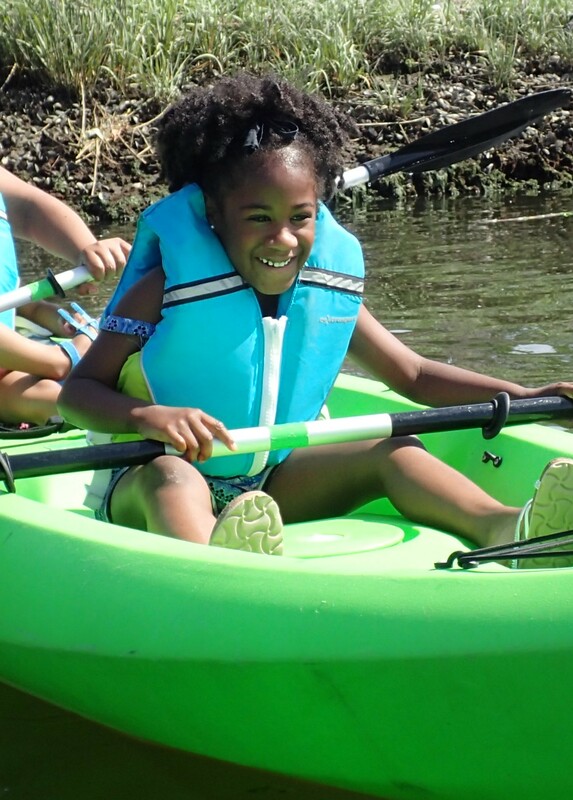 Paddling Among the Dinosaurs with Eastern Queens Alliance! 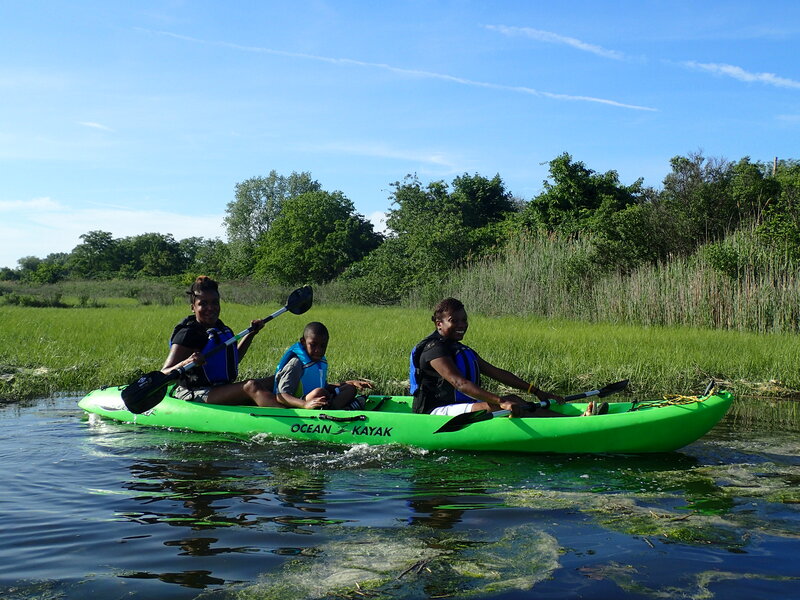 HarborLAB joined Eastern Queens Alliance for a paddle that 65 million years in the making! The setting was Idlewild Park, a sleepy wetlands preserve with a kayak launch at the far end of Queens from our Hunters Point, Long Island City base. In our imaginations it was also a paddle back in time to the Cretaceous, and even Triassic eras. Well, that’s if one sees jet planes landing at the adjacent JFK International airport as giant, silvery Pterodactyls! 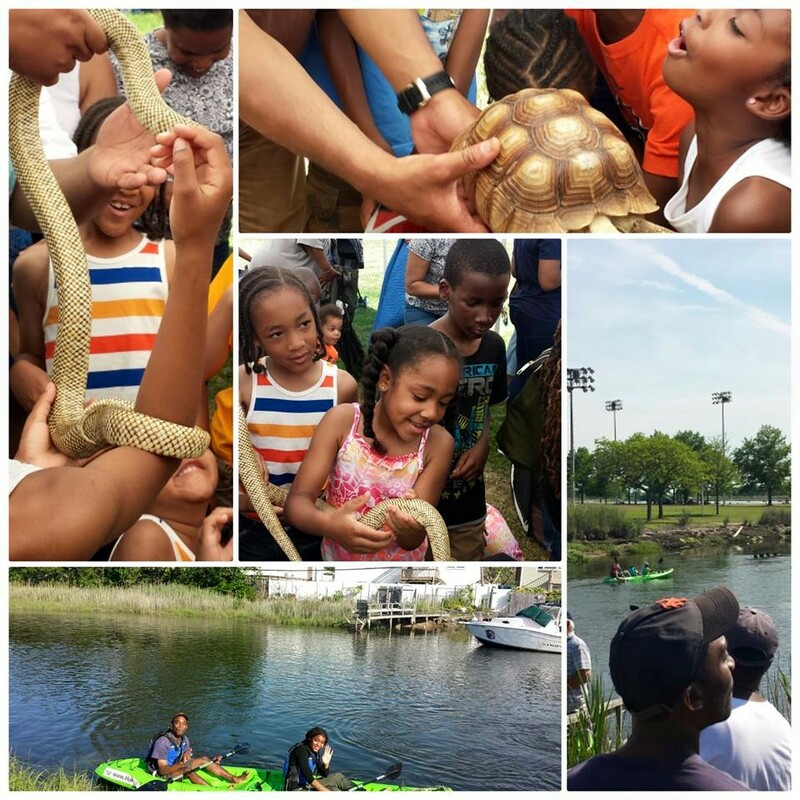 The kids started the afternoon with Reptiles on the Move, which brought snakes, turtles, amphibians, and more to the park for viewing and even touching! Photos by Eastern Queens Alliance. Then it was time to slide into the wild estuary to encounter dinosaurs! While all of the last big and famous beasts of that clade died in what most scientists believe to have been an asteroid impact 65 million years ago, just enough animals and plants (reptiles, fish, small mammals, insects, and even flowing plants) did struggle through to repopulate Earth. And ready for this? Even some theropod dinosaurs survived! These smaller members of the same family as mighty Tyrannosaurus rex and vicious Velociraptors flourished and evolved into what we today call birds! Birds’ closest living relatives are crocodillians (most famously crocodiles and alligators) because they share a common ancestor (which gave rise to all dinosaurs) 250 million years ago. Because birds have evolved so much, becoming so diverse, and crocodillians have barely changed at all, it’s the crocodillians that are the closest thing to many dinosaurs we can see today (skin, teeth, etc). Feathers, however, evolved even before flight, perhaps as a display to impress potential mates, like peacocks today. We saw great egrets, yellow crowned night herons, Canada geese, and herring gulls in the mussel-ringed spartina grasses and double crested cormorants diving into the silty water. Osprey glided overhead and cheeped from nests built into stadium lights. Numerous smaller birds flit past, as did dragonflies. It was marvelous. But no marvelous as the scores of kids and parents who came out to share a perfect day for learning, adventure, and boating with HarborLAB!